They’re the smallest birds in the world AND the most incredible flyers. 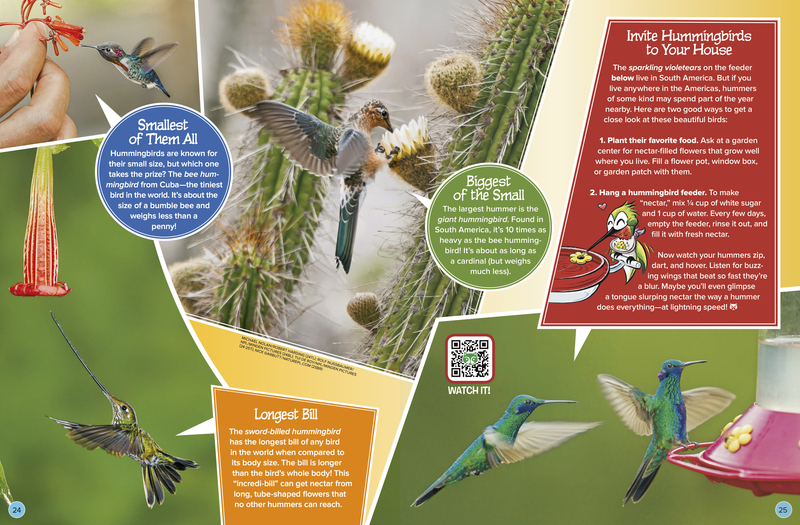 Zip in to meet the hummingbirds. But hurry, because they never stay still for long! Hummingbirds are high-speed flying acrobats. They can dart forward, stop, change direction in midair, hover in one place, and flip upside down. They can even fly backward—something no other kind of bird can do. The name “hummingbird” comes from the buzzing hum made by the bird’s fast-flapping wings. The hummingbirds that live in North America beat their wings around 50 times every second! A mighty heart powers a hummer’s tiny body as it zooms through the air. For every minute in flight, an average hummer’s heart beats about 1,200 times. In the same minute, its hard-working lungs take in around 250 breaths. For all this fantastic flying, hummingbirds need a lot of fuel. Some may visit more than 1,000 flowers a day to sip their sweet liquid called nectar. Hummers also nab insects and spiders to round out their diet. A violet sabrewing hovers in midair to sip from a flower. With wings beating fast and tail fanned wide, this hummingbird has perfect control to reach the flower’s sweet nectar. See the curved bill of the white-tipped sicklebill above? It matches the shape of the flower the hummer is about to feed from. It’s a win-win: This kind of bird doesn’t have to share the flower’s nectar. And the flower gets its own special pollinator. That’s a creature that moves sticky pollen from flower to flower, which allows a plant to make seeds for growing new plants. There are more than 330 species of hummingbirds. They’re found in tropical forests, on mountains, in deserts, and probably even in your own neighborhood. And their feathers come in every color of the rainbow. Males usually have the flashiest looks—to attract females. Check out the Mexican violetear (top left photo). When sunlight hits his feathers, they shine with dazzling shades of green, blue, and violet. The shimmery sheen is called iridescence (eer-ih-DES-uns). And how about the “costume” on the tufted coquette (koh-KET) above left? He can raise that bright orange crest, and long feather tufts pop out from each cheek. For hummingbirds, everything is a competition. They get into battles over who gets the best flowers, perches, territories, and mates. Two male booted racket-tails face off (top right photo). These extra-fancy fellows flash their puffy, white “boots” and long tail streamers in midair fights to decide who’s boss. Like all hummer moms, the ruby-throated hummingbird raises her babies with no help from her mate. She built a tiny nest from soft plant parts. Bits of lichen (LYE-kun) on the outside help hide it. And super-strong spiderweb silk holds it together and allows it to stretch as the chicks grow. Mama laid two eggs the size of jelly beans. Now she’s bringing meals of nectar and insects to her growing chicks. Hummingbirds are known for their small size, but which one takes the prize? The bee hummingbird from Cuba—the tiniest bird in the world. It’s about the size of a bumble bee and weighs less than a penny! The sword-billed hummingbird has the longest bill of any bird in the world when compared to its body size. The bill is longer than the bird’s whole body! This “incredi-bill” can get nectar from long, tube-shaped flowers that no other hummers can reach. 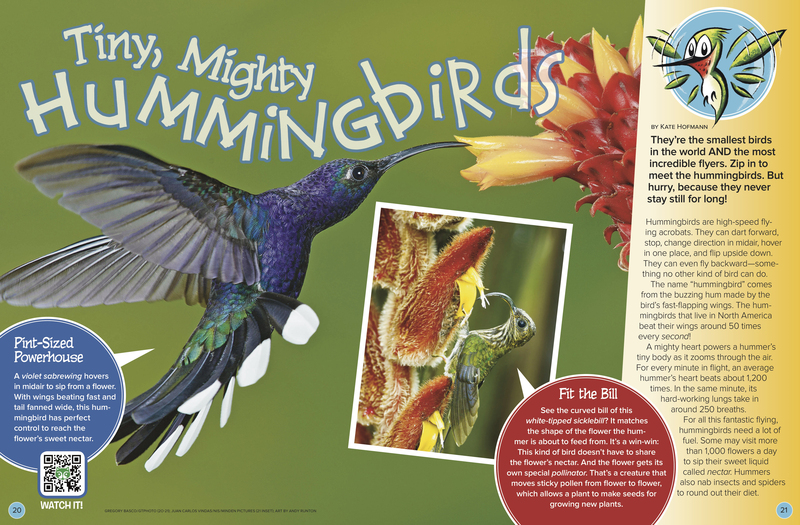 The largest hummer is the giant hummingbird. Found in South America, it’s 10 times as heavy as the bee hummingbird! It’s about as long as a cardinal (but weighs much less). 1. Plant their favorite food. Ask at a garden center for nectar-filled flowers that grow well where you live. Fill a flower pot, window box, or garden patch with them. 2. Hang a hummingbird feeder. To make “nectar,” mix ¼ cup of white sugar and 1 cup of water. Every few days, empty the feeder, rinse it out, and fill it with fresh nectar. Now watch your hummers zip, dart, and hover. Listen for buzzing wings that beat so fast they’re a blur. Maybe you’ll even glimpse a tongue slurping nectar the way a hummer does everything—at lightning speed! 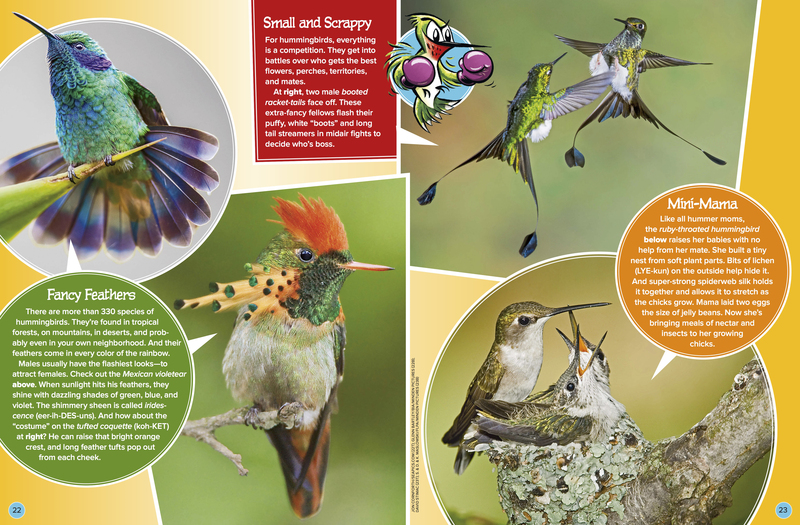 “Tiny, Mighty Hummingbirds” appears in the March 2018 issue of Ranger Rick magazine.